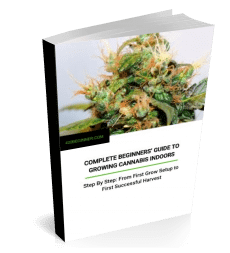 And, yep, we’re talking about actual homegrown cannabis here rather than just hemp seed oil. For beautiful, healthy skin it’s one of the cleanest, most natural products that genuinely works. Which is why I decided to try my hand at a little CBDIY. 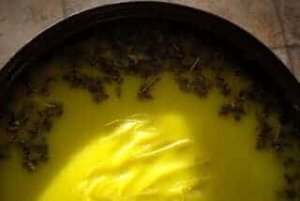 Read on to see how I got on with following a simple cannabis ointment recipe—and learn how to make your own. 1 Why should I make my own cannabis ointment? 3 What problems can cannabis ointment help with? Why should I make my own cannabis ointment? However, many (though not all) just contain hemp seed oil, not oil extracted from the whole mature cannabis plant. Check the ingredients to check what you’re getting. Although, even when you do that, it’s still not always easy to see exactly what you’re really getting. Then why not experiment with making your own genuine marijuana ointments at home? I tried it myself, and in the end I was pretty proud of the results—it’s a great way to make use of your discarded stems and leaves too. However, I must admit that I prefer to just click a “Buy” button! It’s a lot quicker. But back to the topic(al). If you fancy trying to make your own cannabis ointment—and being sure exactly what’s gone into it—here’s the procedure I chose for my ointment making experiment. It’s a bit tedious—but it was effective. Then, I chopped and ground down the leaves by hand—the smaller the pieces, the better they will release the active ingredients. You could use less tiring methods too, like a coffee grinder. Use about 25 grams of stems and about 50 grams of dried leaf per liter of petroleum jelly (or about a liter of lightly squeezed fresh leaves). Next, I began warming the grease in a pan (be careful here, you only want to melt it down into a liquid state, do not let it boil) and mixed in the crushed dry matter to steep. This process of steeping the herb is called “maceration”. Keep an eye on the temperature – make sure it doesn’t boil! Warm the mixture on the hotplate for about 30 minutes, or only for as long as it takes to fully dissolve—heating too long can cause the active substances to be degraded. A half hour is roughly how long it will take to dissolve 1 kg of Vaseline. The larger the volume, the longer the warm up time, of course. During maceration my whole apartment stank like some kind of marijuana lair—I was a little afraid the neighbors might call the police! 🙂 It was so strong even my cat fled the smell. After this first maceration, it is advisable to repeat the warm up process 2 to 3 times more over the next few days. I repeated it once the next day and again the day after. Some people even recommend waiting a week, and then a month, for extra potency. It’s up to you. 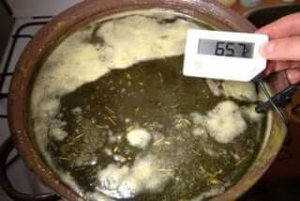 The cooled ointment mixture after the first maceration (i.e. before the sieving stage). At the end of the final maceration, I decanted the green oil from the pan, straining it twice to ensure the resulting product was free from any undissolved green parts of the plant. First, I used a thicker sieve and then for the last sieve I borrowed one of my mom’s expensive stockings (luxury goods for luxury goods, right? 😉 ). If you’re better prepared than I am, though, cheesecloth will suffice (and work out cheaper!). Store the final mixture in glass jars, which should be perfectly clean to prevent the ointment from deteriorating too soon. I prefer Weck Tulip Jelly Jars. I was cooking the ointment for myself, but also as a gift for my friends, so I wanted to put it in something that looked good and seals well. What problems can cannabis ointment help with? And what did I personally use my cannabis ointment for? I struggled for a long time with a skin problem between my toes on one leg. I was ashamed to wear open-toed shoes. I stared enviously at the healthy feet of other women, and hid my own whenever I could. But now, after a month and a half of everyday use, I can stretch out my legs in front of me and take pleasure in seeing my own healthy toes. Every now and then, I still apply a little of my ointment, just as a preventative measure. The problem has gone now, but I still keep my ointment at home just in case it comes in handy for any other inconveniences. inflammation of the tendons and joints. If someone gives you cannabis ointment, make sure you check the color and smell before using it. A dark green color and burned odor indicates that it has been exposed to too high temperatures and its active ingredients may therefore be degraded. Ointment should not contain too much “dirt” (leaves), these particles unpleasantly irritate the skin and can cause itching. Make sure that no moldy herbs have been used to produce it (whenever possible, use freshly dried). Don’t hesitate to give making hemp ointment a try at home with your own homegrown. At least you’ll know exactly what you’re getting. Have you tried your hand at some CBDIY? Let us know your results and recipes in the comments. *Editor’s Note: This article, including the images, was kindly contributed by a Czech reader of the site.